Do you feel that you would love to be more creative, but never seem to be able to find the time to set it aside for artistic endeavours? Why not try keeping an artist’s journal with you whenever you’re on the move, to record some of your day-to-day activities? Even keeping just an A5 or A6 slim-line sketchbook with you, and some fine-liners, colouring pencils or coloured gel pens is enough to start you off, and can keep you artistically engaged in the world around you. Even better, you don’t have to carry lots of materials around, nor do you have to set aside special time after a long day to do it – just keep your drawing gear in your bag! Seize and capture any moment! Whilst you’re on the bus, waiting for a train or in the airport, in a queue at the post-office or even on a lunch break, taking out a sketchbook and drawing/ doodling/ writing can really calm you down, help you to relax and allow some small moments of creativity into your day-to-day. Whether it’s a peculiar architectural detail, a quick interaction between two strangers or simply a colourful window display that captures your attention, try to note it down in whatever way comes to you. Drawing has been proven to relieve stress and engages your brain in a different kind of mental stimulation - and it’ll help you to put down your phone and be with yourself a little more. Our Hahnemülle journals and booklets have lined pages alternating between blank pages, allowing you to note down ideas, thoughts and bits of poetry, or even funny comments overheard at a supermarket. All these minor moments that you capture eventually build into something much bigger, which you can look back on in your visual diary. Small ideas or colour studies quickly noted down can also be the germinations of bigger ideas, such as a series of prints, paintings, a poem – or even all three. Pen, pencil, watercolour, pastel... use anything you like! If you’re feeling a little more ambitious, and love the idea of noting the wonderful changing colours of spring, for example, you could always keep a Van Gogh watercolour pocket box, a travel-size bottle of water and some Fabriano A6 postcards with you. Equally, carrying a handy small pack of Rembrandt pastels with an A5 or A6 kraft paper sketchbook means you’re always prepared to embrace the surprising, moving or intriguing moments of your day. You could also collage onto some pages in advance, with newspaper, magazine cuttings or tissue paper which can give you something to work on, instead of the (sometimes frightening!) blank white page. As you become more accustomed to carrying a sketchbook around with you, your observation and drawing skills will also develop. Remember – you’re not setting out to make a phenomenal ‘work of art’ here, nothing needs to be judged. If a drawing doesn’t work out, don’t worry, just move onto the next page, and you can always make it into something else at a later date. You are making personal observations that relate to you and the quiet moments you encounter throughout the day, and no one needs to see what you do - unless you want them to! This entry was posted in Blog Home, Articles and tagged art, sketching, inspiration on June 30, 2016 by Ginny Elston. Amanda Adam is a Scottish painter, printmaker and draughtswoman. Born in Dunfermline, she now resides in Crossford, Fife and is currently undertaking her Masters in Fine Art and Humanities at the Duncan of Jordanstone College of Art and Design (DJCAD) in Dundee. The artist studied drawing, painting and printmaking at the Leith School of Art in Edinburgh, before going on to complete her BA Degree at DJCAD. Here, we ask Amanda about her processes as an artist, her inspirations and thoughts on the role of art in society. What kind of art do you produce and how/ when did you start to get involved in making work? I am predominantly a painter. My practice is based on landscape, our responses to place and how we function spatially within it. Recently my work has started to come off the wall, taking a more sculptural form. When I started painting at the Leith School of Art, I felt if I could specialise in painting I could expand into any other medium. However, I always come back to painting as it is my passion, the area in which I lose myself. I don’t remember the first work of art I ever saw but I cried the first time I saw a small Van Gogh paining, a portrait of Alexander Reid in The Kelvingrove art Gallery and Museum, in Glasgow. The sitter was an art dealer who built up a collection of French 19th Century paintings which now reside in Glasgow Art Gallery. Van Gogh and Reid shared lodgings in Paris at the time when the portrait was painted 1887. I just felt really humbled and in awe. I work with canvas using a traditional oil paint/ linseed oil/ dammar varnish mix. However I have recently started working in gouache as well. Oil paint does what I need it to do, running, spreading, dripping. I can layer, scratch and cut into it easily. Moving forward I would like to work with stone and ceramics, but in the more immediate future probably photography, film and sound. While humans are absent from my landscape-based work, a presence of the viewer suggests itself, making it understood that the terrain is not ‘empty’, but rather filled with the same elements that sustain all life. The chaotic myriad of colours is derived from intangible feelings to which I subconsciously respond; it is that ‘spirit’ of place contrasted with the punctuated presence of line. Lines provide structure to our lives; within the work it is the contours of the land contrasted with man made objects, which offers stability and dynamism. The paintings become installations and sculptures on the very land that I paint, creating their own sets of lines and movements. There are advantages and disadvantages to higher education within art. If you are unsure about your work you can very easily be pushed or swayed into making work which you are uncomfortable with or which you don’t feel is your own natural response. You can feel confined and if you spend too many years in ‘the system’ you can also get too comfortable. The advantages are that you have so many opportunities to practice so many areas of material exploration, through workshops, tutorials and artist’s talks all at your finger tips. Plus a formal art education can open other doors for you in the way of scholarships and awards etc. if that’s what interests you. It has definitely helped me to hone my ideas, allowing me to recognise the subject matter which drives my practice. Those who work with sincerity, intensity and passion, no matter what their subject matter or medium; artists whose work comes from the heart. I am influenced by everything around me, every journey I make in a car, a bus, a train, as the land races past me - I find that very exciting. Walking in the landscape, just being, sitting, feeling, being at one within it. I like to go to remote places. Residencies are great as they allow you the time in one place to really ‘feel’ your surroundings. The Bothy Project in Scotland and the Clipperton Project are two residencies which I have taken up recently, but there are so many available. My MFA studio is a small office space where I make water based works and more experimental pieces. It’s really a place where I do a lot of small work, make applications, etc. My home-based studio is the top floor of a golf Club, based in a small castle-type building. The scenery, the golf course is beautiful and serene. From the windows I look from Fife right over to the Lothians. But actually my studio is really out on the land where I make site-specific work. Trust your instinct, collect, experiment, ignore your anxieties and be prepared to feel all emotions at the same time whilst making work. Art has been part of man since the dawn of time. It allows us to dream dreams and our souls to dance. Art is life-enhancing, entertaining and defines our personal and national identities, and is the ultimate freedom in expression. This entry was posted in Profile on Artists and tagged artist, inspiration, painting, fine art on June 23, 2016 by Ginny Elston. Originally trained as a graphic artist, Nicola has had a varied career working in public relations, the media and the travel industry. She returned to her artistic roots, becoming involved in interior design, specialised painting techniques and mural work both at home in the UK and internationally. Now living in the Languedoc region of Southern France, Nicola’s work has featured in Country Living magazine, BBC Radio 4 and Central TV. We’re going to hear from Nicola about how she works in the following interview. Personally I love painting still lifes, but I also paint commissions, and have produced portraits, people, pets and houses. I create murals and also teach at college level, with students with special needs and with private groups on painting holidays. I work in all media but I’m exploring more with the potential of watercolour, which is what I’m teaching at the moment. I have exhibited in both the UK and France. I want to get back into oils. 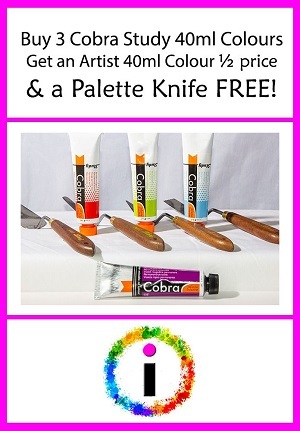 I’m also going to use the new Cobra range, which are water-based oil paints. My friend Libby Page loves them. I’m a big fan of colour, so anything colourful which can evoke a mood or a feeling. I am not affiliated to any galleries or collectives at the moment. If from other type of background (i.e. no formal art education) what were the reasons for not pursuing this route and how do you feel this has influenced your art? I love the vivid colours used by Shirley Trevena and many of the great masters and the Dutch still life painters. This entry was posted in Profile on Artists and tagged art, artist, inspiration, painting on June 23, 2016 by Ginny Elston.